Celebrate the completion of Three Points and help us fundraise for more public art in our communities! MUSIC, FOOD, BOOZE, ART, AND MORE!! Trust us - you won't want to miss this event! This event is open and welcome to everyone, so there will be no cover for the event, but we are asking for at least a $5 donation so we can reach our fundraising goal of $20,000. There will be artists painting during the event and guests will be able to silently bid on the artists' work to take home! Proceeds go to the artists and the Three Points fundraiser! Artists include: Henry Cunningham, Braylyn Rosco Stewart, Damon Thompson, Robby Burgess, Ben McCloud, and Sam Mattingly. 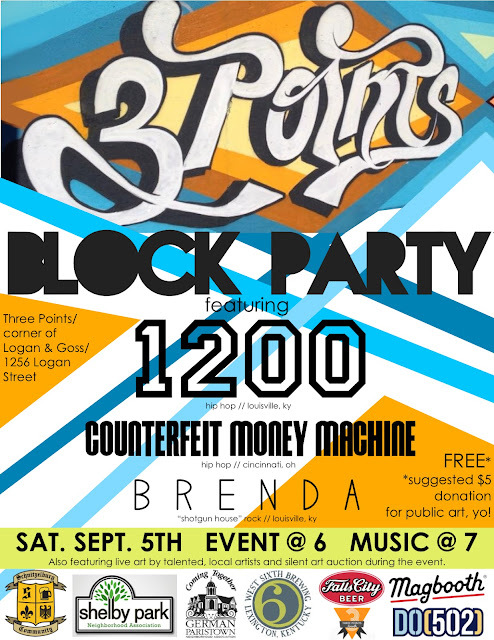 The block party will be outside in the lot adjacent to Three Points (Save-a-lot/Derby Dental). Bike parking will be available courtesy of Falls City Community Bike Works and Bicycling for Louisville. Are you a non-profit that would like to be involved? A human with a good heart that wants to volunteer? Someone who is licensed to sell delicious edibles to the public? An artist who would like to get their art on during the event? Shoot and email to jnnfr.r.chppll@gmail.com. Saturday, September 12th, 8 am to 3 pm. Join your neighbors to sell and/or shop on the beautiful grassy lot at the corner of Texas and Burnett (1138 East Burnett Avenue)! Reserve your spot today for only $10! You will need to furnish your own tables or blankets. * Spots MUST be paid for by date of sale, preferably by September 9th. We will promote it but please share the word with your friends.